What kind of language is necessary in a bill for you to consider it a "jobs" bill? 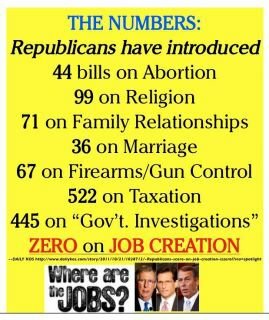 If one truly believes that lowering taxes spurs jobs growth, then one could argue that they have introduced 522 jobs bills. Must a bill include massive spending for you to consider it beneficial to job growth? If there were 522 bills on cutting taxes, there were 522 bills on job creation. You guys are trying to use logic to change the conclusions of a man who didn't use any logic in initially reaching those conclusions. According to Obama's own economists, the Stimulus cost us $278,000 per job "saved or created." Why the hell would we want any more bills like that? What evidence can you present to support your contention that lowering taxes creates jobs? I can present plenty of evidence against it. Can you point to any jobs created by those bills? Because we had a decade of tax cuts under Bush and as far as I can tell that didn't help much, so I'm skeptical of this whole tax cuts = jobs equation. Right now what I see is teachers and other state workers losing their jobs so that everyone else can keep a penny or two more on their dollar. To me that's not a good trade off. Look at where the jobs would have gone if not for the stimulus. Do lower taxes = jobs - not hardly! "Do lower taxes = jobs - not hardly!" You are right. Lower taxes increase jobs inevitably. Anonymous - The chart you reference says very little, if anything, about the relationship between the top tax rate (which is all it is using - and you don't even know which top rate that is referenced by the DOL here) and job creation. And, if anything, it refutes your argument in many of the years over the past 30. Your going to need more than just a relatively meaningless graph to make your argument cogent. Of course, I rarely come to this site anymore because all I usually see is the same cast of characters calling those they don't agree with all kinds of names and displaying mostly angry rhetoric, much like the author of the blog.